"As a company, we are always brainstorming ways to further our artisan collaboration mission," says designers Genevieve Saylak and Corissa Santos, "Whether through improving a relationship with an existing partner or seeking out new communities, we’re constantly growing and developing this part of our business." Enter the duo's contemporary brand where Mountains Meet which is quickly becoming known for championing responsible design, artisan craftsmanship and collaboration. By working with some of the most talented artisan groups across India, Guatemala and Bolivia the growing New York-based brand is establishing its presence on a global level. 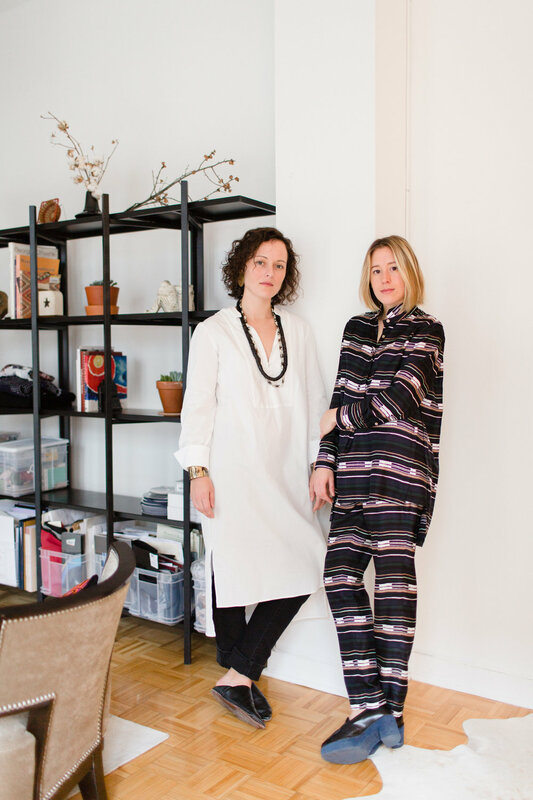 In doing so, Genevieve and Corissa's design approach is very much rooted in exploration, adventure and culture. Each piece stays true to their modern, thoughtful and eclectic vision - think muted color palettes, eye-catching prints and beautiful textures. With all of this in mind we found ourselves swooning over Genevieve and Corissa's equally inspiring studio tucked away in the bustling Garment District neighborhood. There, we chatted with them about their inspiration, design resolutions and their experience in building a contemporary (and sustainable) fashion brand. Read on to meet the designers for a glimpse into the world of where Mountains Meet and enjoy a second part of this interview on The Style Line. Genevieve: If I’m not working you’ll find me running on the West Side highway, traveling, cooking, hiking in Jackson Hole, WY, or spending time with my boyfriend, Greg, my close circle of friends and my parents. I have a very small family and we’re incredibly close. I wholly believe in investing in handful of life-long relationships, and that there’s nothing a long run, a glass of good wine and alone time can’t solve. Corissa: The things I value most in life are faith, family and nature. I was born and raised in Portland and growing up on the West Coast, specifically the PNW, really defined who I am and what I enjoy doing. I start to get restless when I am not able to go on a hike upstate or a run through the park! If for some reason you can't find me on a mountain I am probably eating tacos, rock climbing or sipping on some delicious coffee. Give us a brief overview of your relationship as both friends and designers. What has it been like to create a brand together and what advice can you offer to those who are working with partners or co-founders? We met in college, in our studio art program, and have been friends ever since. There’s a beautiful yin-yang thing about us—we could not be more different in certain ways, but also have so many shared interests. We both agree that the other is the only person we’d have embarked on this journey with, and that says volumes about the importance of picking the right partner. It is, hands down, the most critical part of building a successful company. Pick your foil, so that you’ll always be challenged. Pick your compliment, so that your vision is clear and mutually understood. Pick someone you can eat excessive amounts of tacos with, because, well, things get real in the world of entrepreneurship and tacos cure all problems. We recently had an event at the Brand Assembly Square NY with Nest that spoke to the realities of building sustainable/artisan-made brands. With this in mind what have been some unique challenges, rewarding takeaways and general lessons learned while working with these groups? Working with artisan groups is at once the most terrifying and rewarding experience we have as designers! Terrifying, because there is more room for error due to the hand nature of the work (i.e. inconsistencies, longer lead times). Rewarding, because we are able to support these communities, that are primarily female dominated, through their craft. We’ve certainly had major highs and lows, but at the end of the day we truly view these relationships as partnerships. We are committed to these communities and we work together to problem solve and create solutions that work for both of us. And, at the end of the day, we are able to create incredibly beautiful, unique items for our customers. What has been inspiring you in terms of the design process lately and do you have any design related resolutions as the new year draws closer? As of late we have been very focused on pieces we view as "essential" to our woman. We want to offer our customer a very clear, concise assortment that embodies who we are as wMM without losing our eclectic, design-driven aesthetic. We believe there should be value in every item we are offering her closet. As we step into the new year our resolution is to work on refining what this concept means to us. In reality, this will probably be a never-ending process! We connected with Brand Assembly through our showroom. Brand Assembly is such an amazing supporter of emerging designers, and we have been lucky enough to be a featured brand in their retail space at the Lord & Taylor flagship in Manhattan. This partnership has offered us a unique opportunity to dip our toes into the department store world, without have to dive into the deep end just yet. With the holidays fast-approaching what are 3 core pieces you would recommend as holiday gifts for the where Mountains Meet woman? Definitely our Erin Cashmere Turtleneck, Georgia Blouse, and Skye Shirt. Something for all those holiday parties and something to curl-up by the fire in! As a company, we are always brainstorming ways to further our artisan collaboration mission. Whether through improving a relationship with an existing partner or seeking out new communities, we’re constantly growing and developing this part of our business. From a design perspective we ask ourselves daily, how can we improve? How can we source better materials, perfect our fit or refine our offering. There is always room for improvement.